In a lot of ways, it still feels like a dream. 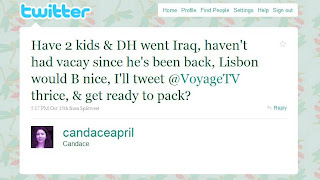 A few weeks ago, I saw tweets flying back and forth about winning a vacation from Voyage.TV. Normally, I would have just assumed it was either “too good to be true” or that my chances of winning were infinitesimally small. 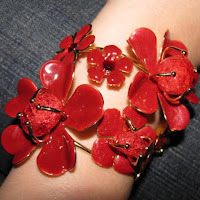 But then I saw that Liz @Mom101 (and Cool Mom Picks editor) had actually won (and gone on) a trip to Barcelona. Wow. 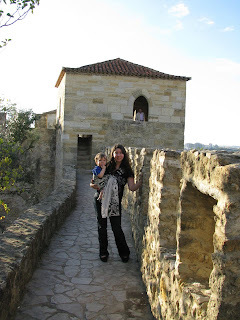 My husband and I used to travel all the time (Rome, Florence, Venice, Sicily, Angkor Wat, Bangkok, the Greek Islands, Prague, Budapest, Romania, Belize, Mexico, Peru, Edinburgh, the Orkneys) but since we’ve had kids we haven’t had the opportunity–the time, energy, or money. I found out I won on a Friday. My husband had actually been planning to take the following week off but the demands of work were making our “staycation” dwindle day by day. Since he already had requested the time off, when I won, we decided to see how quickly we could make the vacation happen. There was also the matter of the kids. My 1 year old nursling is very attached. So, we decided to take both children and turned the romantic getaway into a family adventure. With Voyage.TV covering airfare for my husband and I and the hotel, we were able to purchase the kids’ tickets and upgrade the hotel room. 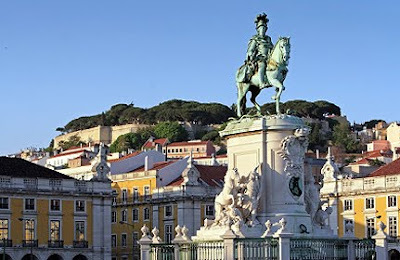 By the following Wednesday, we were in New York City picking up expedited passports for the kids and by Thursday we were on an airplane, headed to Lisbon. And we are so glad we decided to “go for it”. 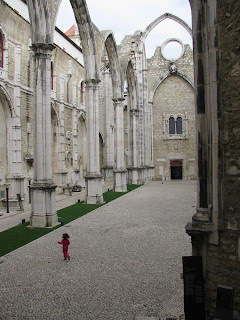 Watching my daughter dance through Medieval Castles, Gothic Cathedrals, and stone-paved plazas was the memory of a lifetime. We explored the ramparts of the Castle of São Jorge, rode an elevator to the oddly tranquil open-air nave of the Carmo Convent (the roof collapsed during the 1755 Earthquake), and climbed the seaside Tower of Belem. 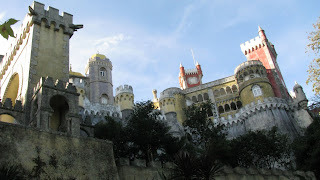 We took a day trip to Sintra and Pena Palace, constructed over time in fits and starts of Romanticism so that it looks like a conglomeration of every tale of knights and ladies you’ve ever heard. The approach is through a dark, ethereal forest, completing the fairytale atmosphere. 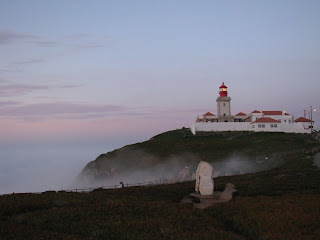 Our last evening was spent at the end of Europe–the westernmost point. On the way home, we enjoyed one more bit of luck: a woman with the patience of a saint played with my son during the transatlantic flight. This Tweet Your Trip contest really helped lift my spirits and recognize all the blessings we enjoy. A student group invited Super Dad to speak about his military experience at our alma mater, so all three of us got to travel to New Haven and Baby Diva got her first taste of Yale. Despite a hellacious flight into New York (delays, delays, delays–thank goodness I am breastfeeding and have a baby wrap), Baby Diva was an absolute doll. We took her out to fancy restaurants, during which time Baby Diva alternated dancing for her adoring public and napping. Baby Diva loved all of the attention and staying up to play cards with her grandparents (she was on my team for Hearts). Granny and Papa live nearby in suburban New York so they came up for the afternoon. Grandma and Grandpa (Super Dad’s ‘rents) live near the airport so we ended our journey with a visit there. Baby Diva is becoming quite the traveler!! !